Brief Synopsis – After his wife mysteriously disappears, a man must deal with trying to figure out what happened amidst all the media attention and himself being the prime suspect. My Take on it – Wow! It’s been quite a while since I have seen a movie where I feel that it’s so hard to keep out spoilers. Regardless, I have no desire to ruin this movie for anyone who has yet to see it, so I’m still gonna keep this spoiler free. I have said this in the past, but I’ll say it again: I’m an advocate of watching a movie before reading the book because it’s the best way to enjoy both. I have heard that this is a pretty faithful adaptation, and if that’s true, then the book must be amazing because it will obviously give us even better character development and will probably expand the story more. Can’t wait to get my hands on a copy of the book! The story is both amazingly told but scary to watch unfold. 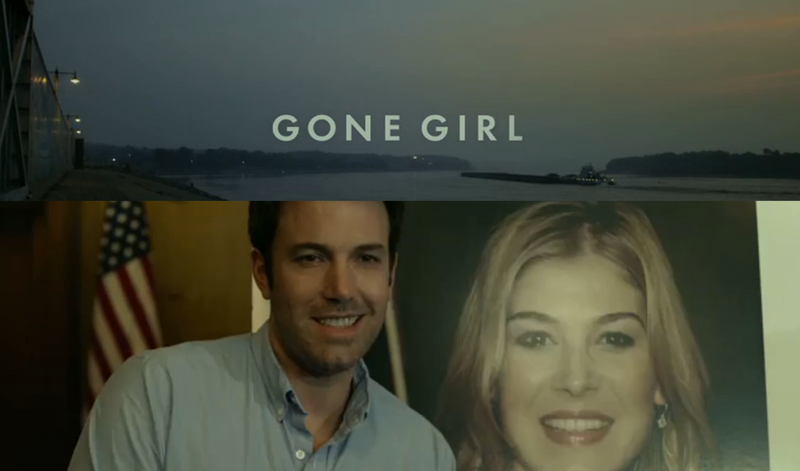 The cast is superb with Ben Affleck and Rosamund Pike giving the performances we love to watch. If you haven’t seen it yet, I strongly suggest you do so. Bottom Line – Great movie that tells an amazing and scary story. Affleck and Pike are excellent. Think I’m gonna have to read this book. Highly recommended! Good for you for getting this review up man. Must be really hard having probably read so many at this point! And you make a very good point as well; this might have been the trickiest movie to review for me in sometime, just based on how hard it is to avoid spoilers while writing. Hah! It’s interesting you mention the reading the book after part. I flirt between reading one before the other, and vice versa. I can always agree that most work really well as companion pieces, for they fill in so much detail you wouldn’t get in the film. This is true more so for the lesser known book adaptations. I’ve read so many good books before the film versions! Yea, history has taught me to watch and then read because very few adaptations manage to fully do justice to the source material. Tnx for stopping by and commenting! The book is really amazing, I could not put it down! Great movie too, but it’s hard to equal the book. Thats what I assumed 🙂 thanks Sherise! Really enjoyed this film. Hoping it will earn a nomination for Best Picture. It’s rare to find huge box office hits that are so artistically impressive. Nice work, Rob! You already know how I feel about this movie. 🙂 It’s funny though–I’ve heard mixed things about the book. Some people loved it, some people hated it because they didn’t like the characters at all. Some people I’ve talked to have said they liked the movie more than the book. I intend to read the book someday and see for myself, but if you beat me to it you’ll have to let me know what you think of it! Wait–is this an HP re-read or is this your first time reading them?? It was well made but if the story doesnt work that’s a huge flaw especially for a murder mystery.